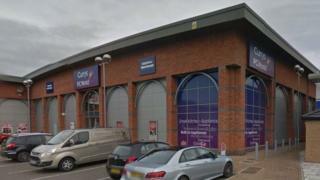 A man has been arrested after a several shoppers were sprayed with an "unknown substance" at Currys PC World. Emergency services were called to the store, in Northfield Avenue, Kettering, at about 15:45 GMT when "a number of people" reported suffering "irritation to the face". Anyone who saw what happened should contact Northamptonshire Police.